Breasley, a bed and mattress manufacturer, have used their expertise in dealing with foam products to create some of the highest quality mattresses on the market. At Bedz 'R' Us we are delighted to offer a comprehensive range of these superb Breasley super king size mattresses. Their super king size range, as the name suggests, is perfect for the main bedroom in the home. But the size does not diminish its amazing qualities. 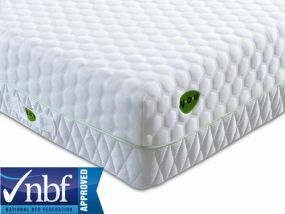 The products are accredited by the National Bed Federation, meaning they uses hypoallergenic and anti-bacterial memory foam. This ensures the mattresses comply with fire and safety regulations, and also makes sure they stay breathable and fresh, leaving you with a cool night's sleep. So take a look at our comprehensive range of Breasley super king size mattresses and take advantage of our free delivery on all items, as well as free next day delivery on selected items.